Tarshis & Hammerman prides itself on it's empathetic professionalism with clients and it's aggressive, dedicated and experienced representation of clients by our seasoned attorneys. 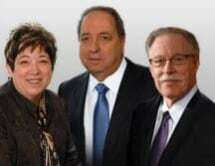 Mr. Tarshis and Mr. Hammerman have each been practicing for close to forty years and each were experienced prosecutors for major District Attorney's offices in the City of New York where each had risen to the position of Bureau Chief. This background in criminal prosecution gives clients a distinct advantage as each attorney is fully familiar with the methods and thinking of the prosecutor's offices. This ability to think as both prosecutor and defense attorneys enables them to obtain the best result possible for each client. In the matrimonial arena, the firm has the ability to listen to clients and deal effectively with the many personal and sensitive issues which people involved in divorce are confronted with. The firm has obtained numerous settlements and verdicts in excess of $1,000,000 on behalf of our personal injury clients over our twenty give year history. The firm was recognized by New York Law Journal's Book of Lists as among the top 10 best litigation firms in New York in 2004.